FALMOUTH – Once upon a time, there was a mother turkey with 11 baby chicks. Falmouth resident Anne Restino feels like she is in the middle of that fairy tale, as a turkey family has established itself around her yard over the past month. Restino, who a friend has dubbed “the Turkey Whisperer”, said she has felt protective of the turkey family since her first introduction to them, via a video taken by a camera she set up as part of a security system near her front door. While visiting relatives in Florida, Restino went online to take a look at what the camera was recording. To her surprise, there was a mama turkey strutting past her front door, along with little animals Restino thought, at first, were tiny mice. “I kept replaying it, wondering what the heck are those,” she said. She finally realized they were turkey chicks, or poults. 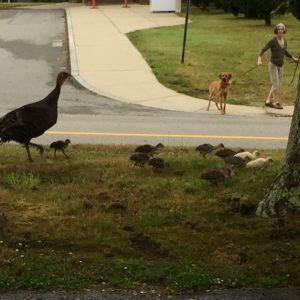 Restino, who walks her neighborhood near downtown Falmouth frequently with her greyhound, Kelsey, had been among the locals concerned in recent months with the disappearance of the iconic Falmouth turkeys. 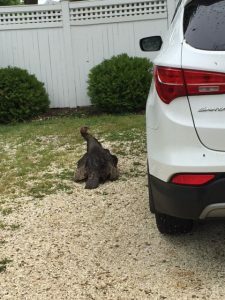 After a Cape Cod Wave video showing turkeys harassing a mailman went viral in December 2015, state animal officials euthanized first one, then a second male turkey, causing the local “turkey gang” to disperse. A turkey family, in top left of photo, has become part of the neighborhood in downtown Falmouth. Over this past couple of months, Restino had noticed what she assumes were two “single lady” turkeys, on hanging out near Shore Road in downtown Falmouth and the other closer to Restino’s neighborhood. “They are never by themselves. I thought she would die of loneliness. I felt so badly for her,” Restino said. She says she is gratified that one of the single ladies seems to now have a family. Restino has been keeping an eye on the turkey family, which at one point had taken over her garden area. “It’s been a cute, funny little thing,” she said. A turkey brood–mother and 11 chicks–hanging out in a garden area. Photo by Anne Restino. She hears the mother turkey gobbling in the morning and she watches the turkey bed down with the chicks at night. Restino said that while there were originally 12 chicks, including 3 all-yellow ones, there are now 11 chicks and only two yellow ones. Restino saw the baby turkeys on a second floor deck at a house in her neighborhood, seemingly learning to fly. One of the blond chicks was positioned at the top of the second floor stairway ready to jump. Restino did not stay to watch but, after that incident, she noticed there were only two of the all-blond chicks. “One of the blondes is gone. I don’t think he made it,” she said. Mama turkey settles into a driveway with her chicks underneath her. Photo by Anne Restino. In the evenings, the mother turkey sometimes settles in Restino’s driveway, the 11 chicks squeezing underneath her. Restino gets concerned about well-meaning passersby who are curious about the mother turkey and try to feed her. “One lady was trying to give her a pizza crust and I explained that she shouldn’t do that,” Restino said. A woman and her dog take note of a turkey family in downtown Falmouth. Photo by Anne Restino. Restino said her turkey videos have been a hit with her Facebook friends and the turkeys have even made her some new friends in the neighborhood. One neighbor who had never spoken to her stopped her recently to talk about the unusual blonde turkey chicks. “People are intrigued,” she said. 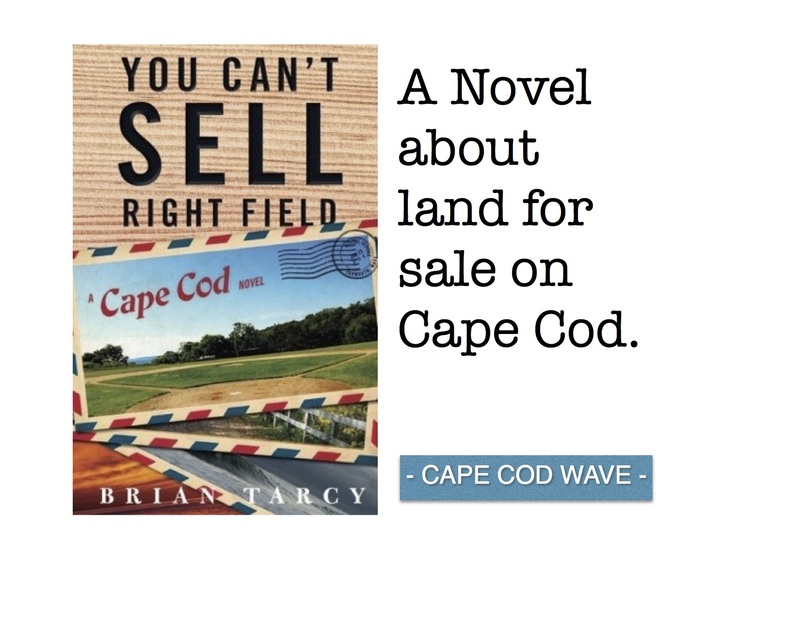 Laura M. Reckford is co-founder of Cape Cod Wave. 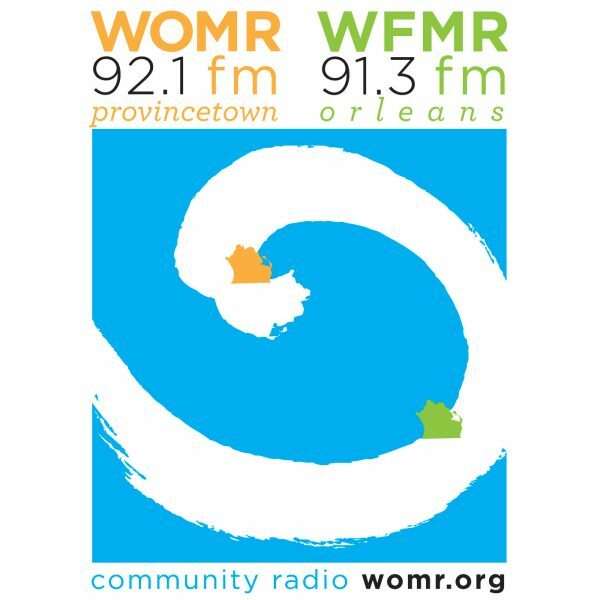 She has been a reporter and editor on Cape Cod for more than 20 years in magazines, newspapers and radio. She has also authored numerous Frommer's Travel Guide editions on Cape Cod, Martha's Vineyard and Nantucket.